Today is all about the customer experience. From the moment a lead hits your website or hears about your brand, to their endless conversations with customer support, how they are engaged, and what they experience when dealing with your company makes all the difference. What is the Customer Experience (CX)? The Customer Experience, or CX, as I will refer to it, is the summation of all experiences a customer has with a brand during the lifetime of their relationship. Everything that happens from the moment I learn about a new brand, to the moment I no longer engage with them, is my customer experience. This includes all transactions, newsletters, advertisements, social media, customer support, and other avenues of interaction. For example, Alaska Airlines knocks the customer experience out of the park. Why? Because of everything within the experience, from purchasing the tickets, to seeing their advertising, in-flight service, and post-flight is pleasant. If you have flown Virgin, you even know that the inside of their planes are flawless. Clean, futuristic, roomy and comfortable. Their flight attendants are also very attentive. Not to mention they relinquish passengers from the tiresome safety productions with an animated version on the screen right in front of you. Their prices are great, their advertisements are great, and I’m a LOYAL customer. This example was to show you that the customer experience makes ALL the difference. I would never fly any other airline if I had the choice. This is the same sentiment you need to give your own customers. Even if you have thousands of dollars for your marketing, your product is only as good as the experience. Luckily, it doesn’t take thousands of dollars, it takes a strong company culture, dedicated employees, hiring the right people, consistency, strategy, some common sense, and last but certainly not least, technology. Company Culture: Company Culture plays a huge part in the customer experience. Everyone on the team needs to be on the same page with what they represent as employees, and the values that you portray to your customers. Your company culture is part of your brand, and your brand is what people will see when they engage with you. Company culture sets the foundation for either a great customer experience or a not so great one. What would you choose? Dedicated Employees/Hiring Right: This also touches on company culture. Dedicated employees care about the companies they work for and their jobs. With this dedication comes hard work, typically resulting in positive outcomes. You want someone that is going to align with your company culture, values and commitment to providing clients and customers with the top-notch service, support and ultimate experience. Conistency: Consistency is key. In the case of Virgin, I have yet to have a bad experience with them. They consistently provide me with quality layered on top of quality. And, guess what? I keep coming back for more. I have a very positive brand image of them. One bad experience can break a brand; make sure to provide the same experience throughout. This includes your website’s look and functionality, how your employees answer the phone, your follow up, and of course, the quality of your product or service. Strategy: You can’t just assume that everyone is going to know how to pick up the phone, or view a customers past purchases in order to give them great service. You need a strategy that everyone in the company adopts. You should have sales strategies, marketing strategies, ‘moment of crisis’ strategies, and everything in between. That way, when something goes awry anyone can be there to save the day. Now, that’s providing a superior customer experience. Common Sense: I absolutely have to mention this one because I think a lot of businesses actually leave this crucial element out of the picture. With all of their researching for the perfect strategy, they forgot that common sense should be a pretty important part of the strategy. The golden rule says, ‘treat others the way you want to be treated.’ Well? Don’t you think that should be YOUR golden pillar, too? Think about how you would like to be treated? What sort of things would you like to see? Whatever your team comes up with here is what you should be showing your clients and customers. Technology: The only way to obtain and track the kind of data you need in order to provide the BEST customer service is with technology. That’s it. There is no other way to try and house/ collect this data without it. I’d like to see someone try. We live in a world of big data, and because that data is necessary in formulating the best customer experience, it’s essential to invest in a technology that supports it. 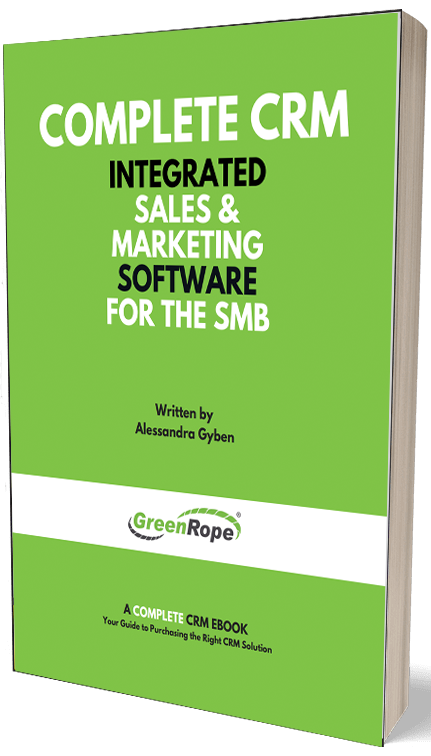 Technology, such as GreenRope, helps you obtain, manage, and analyze all the data you need. From conversions, website visits, social engagements, emails, and more, a CRM should do it all for you. That way, you have all of the information you need in one place. A seamless and enjoyable customer experience is something that all of us want when engaging with our brands. Any business, big or small, can create this, but without the proper systems in place, you’ll find yourself traveling upstream without a paddle.